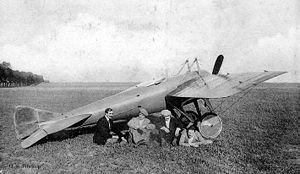 The Deperdussin Monocoque (so-named for its method of construction; literally "monoshell") was a pioneer-era aircraft first produced in 1912 by the Soci�t� Pour les Appareils Deperdussin, commonly abbreviated "SPAD", a French aviation company. Designed as a racing aircraft, the Deperdussin Monocoque was a slim, single-seated plane with a sleek aerodynamic build that was the first of a large range of similar designs that would come in later years. The design is noted for winning the Gordon Bennett Trophy in 1912, and for being the first aircraft to exceed 100 miles (160 km) per hour, and, ultimately, when powered with the first examples of the 160 hp Gnome Double Lambda rotary engine, was able to reach a pinnacle of 125 miles (201 km) an hour, the fastest the model was recorded to fly. Picture - Later adaptions and versions of the Deperdussin Monocoque line included a seaplane, seen here. The concept behind the aircraft is attributed to Louis B�chereau, who was, at the time, the company's lead designer. The design that B�chereau originally conceptualised was considered then to be very unorthodox. Most noticeably, B�chereau revolutionised the way the fuselage was built, and what it was built with; instead of constructing it using a conventional frame, covered in a fabric, which was the adopted means of building a plane's fuselage, he designed a central piece that had several strips of tulip wood glued to it for the fuselage. This central form was later removed, leaving only a rounded shell. This method of construction became known in aviation circles as the "monocoque fuselage", and from the 1930s up to the present day the concept of a load-carrying shell was to become the prevalent approach to fuselage construction. The Deperdussin Monocoques had thin, linen-covered wings. In order to strengthen them, bracing wires stretched from the wing spars to supports on top of the fuselage and to the landing gear. The craft was further streamlined by the use of a large spinner over the hub of the propeller. Overall, the final result weighed around 400 kg (880 lb), when the weight of a full tank of fuel and the pilot are fairly factored in. The Deperdussin Monocoque proved very successful in racing. Over its lifetime, the design was the claimant of the Gordon Bennett Trophy, the inaugural Schneider Trophy race (although the 1913 Schneider Trophy winner was only partly of monocoque construction, having a more conventional rear fuselage), and again successfully defended its title in the 1913 Gordon Bennett race, where it also broke the world speed record of the time, when it flew at a speed of approximately 203 km/h (126.7 mph). However, despite the model's revolutionary speed and design, the trend towards the physically stronger biplane design resulted in few orders from customers. Wayne Biddle - Barons of the Sky: From Early Flight to Strategic Warfare. Johns Hopkins University Press, 2001. ISBN 0801868289.
x�mile Auguste Duchx�ne - Flight Without Formulae: Simple Discussions on the Mechanics of the Aeroplane. Longmans, Green and co., 1914. Jane's All the World's Aircraft. London: Sampson Low Marston. 1913. pp. 89.